On a recent trip to Disney World, I was reminded of how I loved fairytales growing up, both the original stories aw well as the Disney adaptations. I even tried my hand at writing fairytales! While none of my fairy tales were movie quality, they were always one of my favorite writing topics, so I was excited when I recently discovered that February 26th is Tell a Fairy Tale Day! Here are a few ideas for Wixie projects to connect your readers, writers, and thinkers to fairy tales. If we want students to become sophisticated readers and great writers of fairy tales, they need to read them. No doubt your school or classroom library has quite a collection, so begin by reading several of your favorite fairy tales to your students. To help students begin thinking about the style and genre of fairy tales, brainstorm some common elements of a fairy tale. Students are likely to suggest the “Once upon a time…“ beginning to the almost every tale. Prompt student to keep thinking until they come up with several common themes like witches, fairies, forests, magic, and castles. Bring up the idea of patterns and numbers and see if they can identify the use of 3's and 7's in many of the stories. You may also want to read different versions of the same fairy tale by two different authors or two different cultures. Use this as the foundation for critical thinking about the similarities and differences between them. Students love comparing books to film adaptations, so this may be another avenue to encourage critical thinking. You don't even have to watch the movies in your classroom, since many students have already seen several fairy tale-based movies. 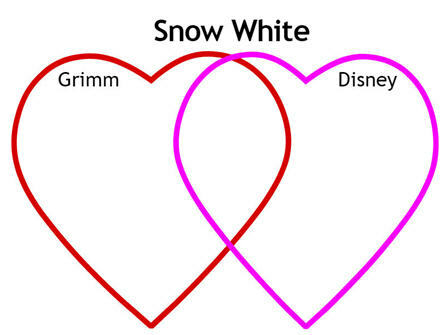 With Valentines’ Day in the month of February, I created a Venn-style comparison for the Grimm brother version and the Disney movie version using intersecting Hearts. You can find a basic version of this template in the February Month-by-Month folder in the Wixie Activities library or on the Trading Post. If you prefer comparing books, the American Library Association has a great list of Multicultural Cinderella Stories and you can find great synopses in a number of different online articles. But of course, the easiest way to celebrate Tell a Fairy Tale Day is to actually tell a tale. You can have students complete a simple retell, modernize a fairy tale, create an adaptation, fracture a fairy tale, or write their own original story. Wixie makes it easy to combine text, illustrations, and voice narration to create multi-page printed booklets, PDFs, eBooks, or digital stories students can share and showcase online! The Seven Dwarfs Mine Train is one of Disney World’s most popular attractions. After reading a fairy tale, ask students to design their own fairy tale-themed ride or attraction for an amusement park. Designing and attraction based on details and themes in a story is an engaging way to ask students demonstrate comprehension. (before Disneyland announced their version of this theme-based ride). Depending on your criteria for design, this can also be an opportunity to use materials in a maker space and integrate STEM design into your instruction. You can use this sort of hands-on/minds-on approach to engage reluctant readers and writers in the work of reading and thinking about fairytales necessary for a successful design. No matter what you choose to do or how you celebrate fairytales, just remember to include a bit of magic and wonder.